Here they are. Seven wearable trends for this fall and winter. Now, a lot of the runway looks aren't practical for certain body types and a trend is one thing that is always changing. I would much rather have someone feel confident and look good (no matter how trendy they are) than to constantly search for the next best thing. But, I have found a few trends that are going to stick around and are lovely for the everyday person that wants a closet update. Space cadet anyone? I absolutely love this trend because it can add a bit of flair to any outfit. Metallic boots really started to reappear this time last year so get going if you want to catch it this fall. They can be paired with just about anything...your summer trend culottes, skinnies, skirts, etc. Just have fun with them. Attention all collarbones! This is an incredible way to show off your feminine figure. I love the thought of showing a bit of skin in the winter because it's so easy to wear bulky tops with max coverage. 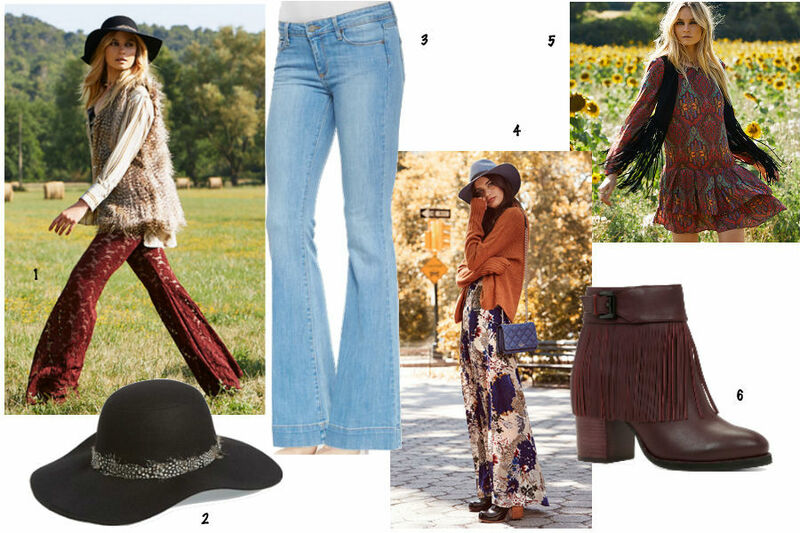 I'm not sure when this trend has ever gone out (I've kept my wide leg/flairs for years), but now stores are saying "You must have 70's for this season". So set aside your skinnies a few days a week and try on some flairs with a boho top. **Stylist disclaimer: Unless you're already tall, flare pants look best if worn with a heel. While this isn't always practical, it will elongate (and beautify) your figure. I've told clients for a few years now...hang onto your classic turtlenecks. They definitely went through an "out phase" and other versions replaced it.. But now, they are back and the great thing is - you can get them anywhere. Update the old duds by putting a turtleneck under a cute wintery sleeveless dress like the pictures below. **Stylist disclaimer: A turtleneck is not flattering for every body type. In particular, if you are heavy chested, have a good bra and go for a thinner version rather than a chunky version. This is a perfect grab for the "I'm feeling bloated" day. *Stylist disclaimer: While it's comfy, it has to be done right. A chunky sweater should be paired with something a little less full on the bottom to guarantee that you don't look bigger. So match it up with a pair of skinnies, a pencil or mini skirt and show off those legs. Such a classic. This is one of the trends I would spend a bit more on because most likely it's not going to fly out the window tomorrow. There are quite a few different capes now...there's a blanket cape, which is a bit more full and wintery, and then there is a fashion statement piece like the cape blazer as pictured below. I don't know if you can call fur/faux fur a trend. It's always beautiful and it's always impactful. This time around, the fur stole has won the show. Of course there are more trends - some that include grey being the "it" color, fringe (in a major way), oversize waist synching belts, patchwork clothes, and more. Let's be real...this post could get out of control. Regardless, whether it's a trend or not, wear what you love and what helps you be the best you. Wedding Wednesdays are back again. 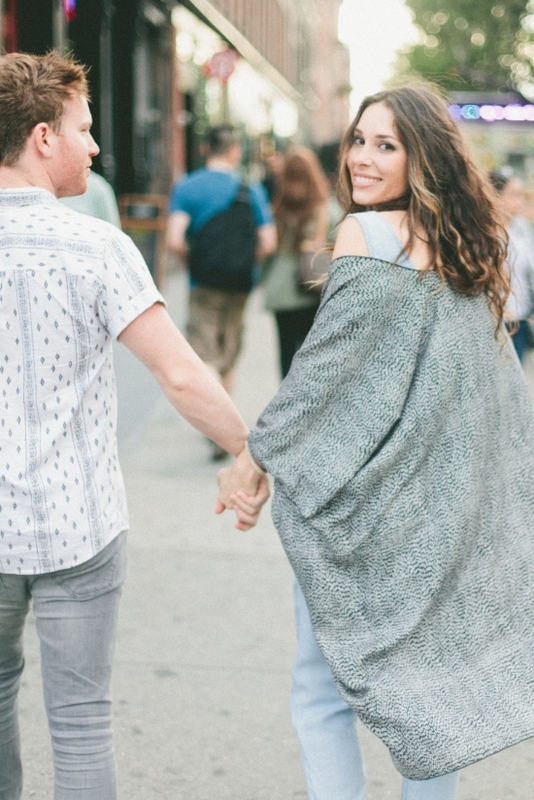 Now that I showed you my dream NYC proposal (if you didn't catch it, click here), let's have a chat about how to dress for engagement photos. Once you get a chance to breeze through our pics, be sure to scroll down to the bottom of the page to catch the interview with our wedding photographers on what to wear. 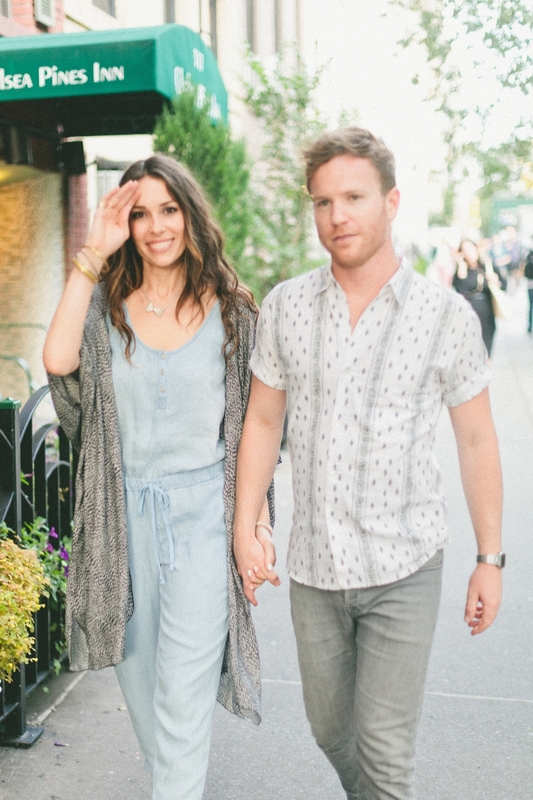 Most couples have the luxury to shop and pick out coordinating outfits for a few weeks. Yet, on the day of the proposal, Jared surprised me with a next day engagement shoot with the same wonderful photographer, Kelly Christine. That may sound like enough time, but since I didn't even know that I was getting proposed to just a few hours earlier, my mind was...well...still swirling. Jared and I blasted through Soho the next morning for our outfits. Talk about a woman on a mission. We visited Top Shop, Zara, and a number of other stores. I wanted a city outfit - sleek and current. Jared wanted to "twirl me", as he said, so he pushed for a skirt. My new fiancé won. I couldn't deny those dimples! Location was a big deal to us since, after all, we were in New York City. So we ventured from Central Park to the Meat Packing District for a non-touristy, city feel. The photos truly captured how special that week was for the two of us. For more pictures and our feature on Green Wedding Shoes, click here. We're actually going to do another shoot with our wedding photographers, Teale and Justin from Teale Photography, in the coming months. Now that we have time to plan for our shoot, I asked them for a few words of advice about what to wear. I know how to style on a creative set for an artist, but I wasn't sure how similar it was to style for a lovebird shoot, especially when I was one of the two lovebirds. 1. 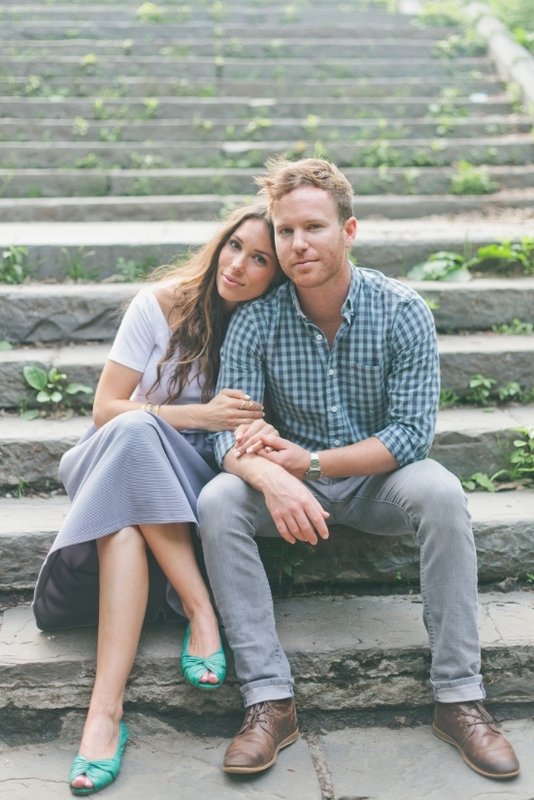 When are engagement shoots usually shot? - Save the dates are usually sent out 6 months or so before the wedding and invites are 2-3 months before the wedding so they book their engagement session accordingly. If a couple wants pictures in their save the dates, they will plan their engagement session prior to sending out the save the dates. If they don't want pics in their save the dates they will book me closer to the wedding. 2. Are there certain colors that look better on camera? Are there any colors to stay away from? - Vibrant colors look best on camera. But, it really depends on the photographers edit and the clients preference. I love bold colors. Some love naturals and neutrals. It's more about what looks good on the client's skin. 3. Does it help for the couple to bring a few ideas they have to the table? - Yes, as busy photographers, we don't personally want to come up with everything the client wears or props they bring. We can help them with ideas if they give us an idea of their vision. 4. How matchy, in your opinion, should the couple be? - Again, this is preference on the client's end. Every photographer is going to like a different style. I think the themes of clothes should match, but not the colors. I love different patterns and color schemes. Again, it must be flattering to the couple. I would always avoid making them look identical. That's like a family shoot and not an engagement session. We want to see the femininity in her and the masculinity in him. - Dress to move around and act like 'lovers'. There will be lots of PDA! Dress your style times 10. Don't be afraid of bold color. Also, if you change locations like we did, don't be afraid to change your outfits to fit the surroundings. Just be aware of time because the change usually counts towards the allotted time for the session. When it comes down to it, wear something that screams you, but remember, the photo is supposed to scream your love more than anything. Have fun with them! Hope this information helped! Remember, even in your engagement photos, be the best you! And the content is gone! Sorry to surprise you! After getting such a great response over my Closet Audit Guide, I realized the information that I loved sharing with you on my blog is crazy practical advice that can't be found elsewhere. Who would've thought?! What I'd love to do is put it in an e-book or something of the sort. I'm in the process of refining it so I can have even more info to offer you. If you're on the email list, you'll be alerted when the information is available. If not, sign up!